Bear Creek is located only 1800 ft from downtown HELEN, GA. 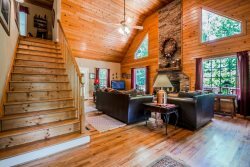 This is a one of a kind PRIVATE cabin just a short walk to downtown Helen where you can shop and enjoy all Helen has to offer! Enjoy the beautiful stone masonry gas fireplace while sipping on some fresh ground locally roasted coffee or sit back and relax on the hand-carved wooden glider for two listening to the babbling creek underneath your feet! You won't want to leave the property with the natural beauty of the rhododendron and mountain laurel aside the beautiful azaleas and hydrangeas that are planted throughout the property! This cabin is great for families with children as well as two couples. Keep in mind there is one shared bathroom. The master bedroom has a queen bed with a/c controls in the bedroom and flat screen TV with DVD player. The guest bedroom boasts a queen bed and a set of bunk beds that works great for kids and couples alike, also equipped with a TV and DVD player. The cabin has FREE WiFi, a Smart TV in the living room so you can keep up with your favorite shows. The cabin has a rustic bench nook kitchen table with a fully stocked kitchen with upgraded stainless appliances. The pièce de résistance are the back decks that all have timeless views of the babbling creek. Sit back on the porch with the Bluetooth speakers playing your favorite tunes or just listen to the sounds of nature and the creek, either way, you are in paradise! Upon completing the payment, we will email a receipt to you and a copy of the Blue Creek Cabins rental terms and conditions. Complete your electronic rental agreement, by reading and signing and returning it to [email protected] with a clear copy of your driver's license. After the final payment is made, we will send you our welcome package which contains the driving directions, lockbox key code and other details about getting TO and IN your cabin.